Idlis are one of the best and healthiest options for breakfast. They are not only great for adults but also good for babies, toddlers and kids of all ages. Idlis are wholesome, steamed and healthy. But, often children complain of not liking the same plain idlis. 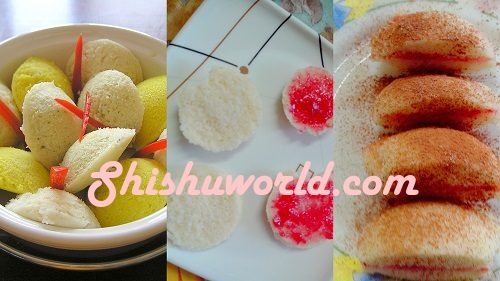 Here we present four unique idli recipes which the children will gobble up. Kids often get bored and do not want to eat the same old, plain but healthy stuff. A little effort to reinvent the thing might just be the motivation that the child needs to eat the same dish. 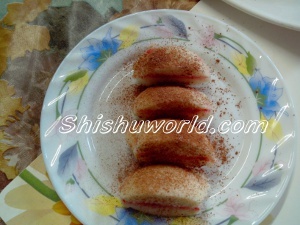 Here we have converted regular idlis to sweet, sandwiched dessert which looks nothing like its original. You may use any kind of idli to make this dessert. It could be rice idli, raw idli or ragi idli that you can use to make this sandwich dessert. Cut the idlis into halves horizontally. Apply jam on one half of the idlis. Cover with the other half to form sandwiches. Cut into halves and sprinkle with icing sugar or chocolate powder. Tip: You may also use chocolate syrup or nutella in place of jam. Here is a video I made to explain it better!! This is another hit in my home and something that was inspired just like the sweet idli sandwich above. My daughter love the peanut butter that I make at home. It is so simple to make. You may find the detailed step by step recipe here. Peanut butter and banana is a classic combination and you will find this combination being used in plenty of desserts. So, one day my daughter asked for a peanut butter idli and this is how this sandwich was born. Apply peanut butter on the inside both halves of the idlis. Slice banana into thin slices. Place banana slices over one buttered idli half. Cover with the other idli half to make the sandwich. Press the sandwich firmly and cut into half. You may sprinkle a little icing sugar/ chocolate powder but it is optional. After two sweet idli sandwiches, let us now make two savoury idli sandwiches. This is so easy to make and gives you the taste of idli as well as masala dosa. Ensure that you potato masala is mashed well and is not very chunky. Make small flat tikkis using your hands. The size should be smaller than your idli mould. Now, heat the water in your steamer. When it is ready, grease your idli moulds. Fill half the moulds with idli batter. Now place the aloo masala tikki carefully in the centre and then cover with idli batter. Steam for 15-20 minutes as you do for regular idli. Take the idlis out from the mould and serve with peanut or coconut chutney. This is another yummy and wholesome variation of idlis. Heat the water in your steamer. Let the paneer bhurji cool down a bit before putting them in idlis. When the water is steaming, grease your idli moulds. Now using a spoon place small amount of paneer bhurji carefully in the centre of the mould and then cover with more idli batter. Take the idlis out from the mould. Cut the idlis in halves to show your lovely paneer bhurji sandwich. Serve with peanut or coconut chutney. Hope these variations will help you in adding some spice to your regular plain idlis and you children and your whole family will enjoy these. Do not forget to leave a comment below to let us know what you feel.